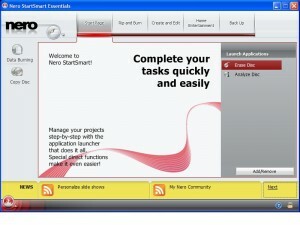 Nero just released a free disc burning program: Nero StartSmart Essentials, based on Nero 9. I’ve used the Nero software that came with my CD and DVD burners over the years and found them easy to use so I thought to give this version a go. The download was 55 MB with an installation footprint of 130 MB and when running a memory footprint of 52 MB. Upon launch you’re greeted with a wonderfully clean looking program with multiple tabs: unfortunately every tab prompts you to upgrade. The only thing you can actually do with this program is burn data to a disc or copy a disc, the two options on the left side. A little digging revealed you can also erase and analyze a disc, two options I was able to add to the right side under Launch Applications. 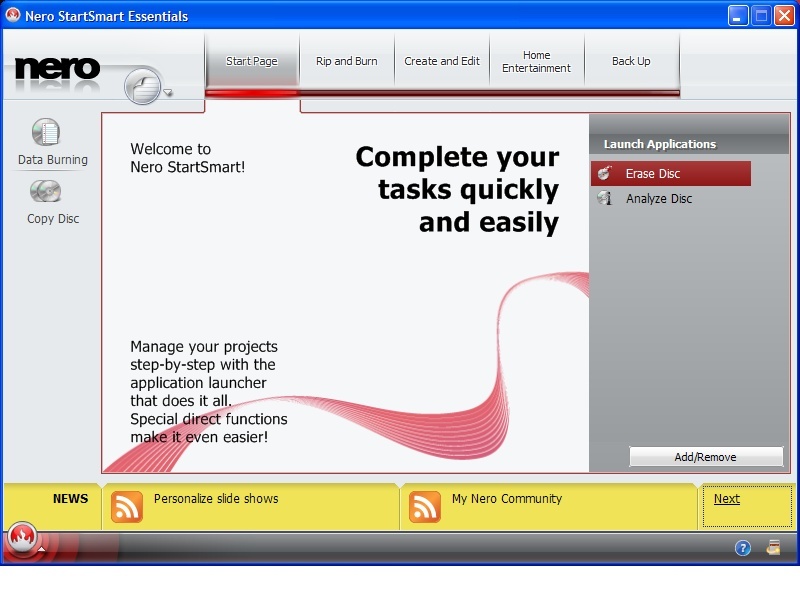 In the end StartSmart Essentials is a downloadable commercial for Nero’s other products: don’t waste your time downloading and installing it. Full and free disc burning applications are readily available, such as CDBurnerXP or ImgBurn. I have these two installed on my system and they use a fraction of Nero’s footprint and provide a breadth of uses.